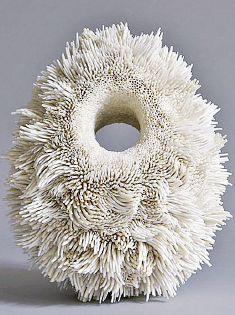 British multi-media artist Rowan Mersh is attracted to the beauty of the natural world, using thousands of seashells to create mesmerizing contemporary sculptures. His experimental approach has him transforming ordinary objects into high art, with the results revealing close attention to shape, colour, and geometry. For Mersh, this individuality is part of the intrigue.